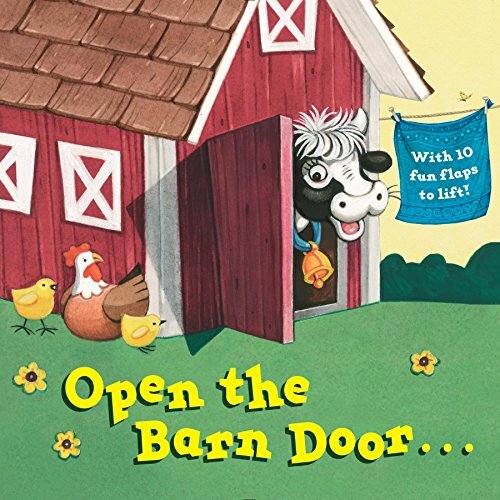 From the creator of OPEN THE GARAGE DOOR comes the hit lift-the-flap board book all about your favorite farm animals! Spend a day on the farm and explore all the animal sights and sounds! Featuring 10 lift the flaps and a variety of barnyard favorites, including horses, chickens, cows, and pigs, this board book is a fun-filled introduction to life on the farm. Illustrated in full color. Open the barn door and take a tour around the barnyard to find out just who's making all those wonderful animal sounds. Christopher Santoro has been illustrating children’s books for more than 30 years. He has been honored by the Society of Illustrators, the American Institute of Graphic Arts, the American Library Association, and The New Yorker. Some of his titles include It's Haunted, Noah's Ark, and the upcoming Open the Garage Door (available 1/2/18). 1. Open the Barn Door. 2. Open the Barn Door. 4. Open the Barn Door. 6. Open the Barn Door. 7. Open the Barn Door. 8. Open the Barn Door. 9. Open the Barn Door. 10. Open the Barn Door.